George McGraw, founder of DIGDEEP, works to empower young people to address drinking water inequalities across the U.S.
George McGraw, founder and executive director of DIGDEEP, spoke at Rollins last week to inspire and encourage students and faculty. DIGDEEP is a human rights non-profit that works to ensure every American has access to clean running water. McGraw explained that he and his team at DIGDEEP take two approaches to eliminating water-poverty from America. 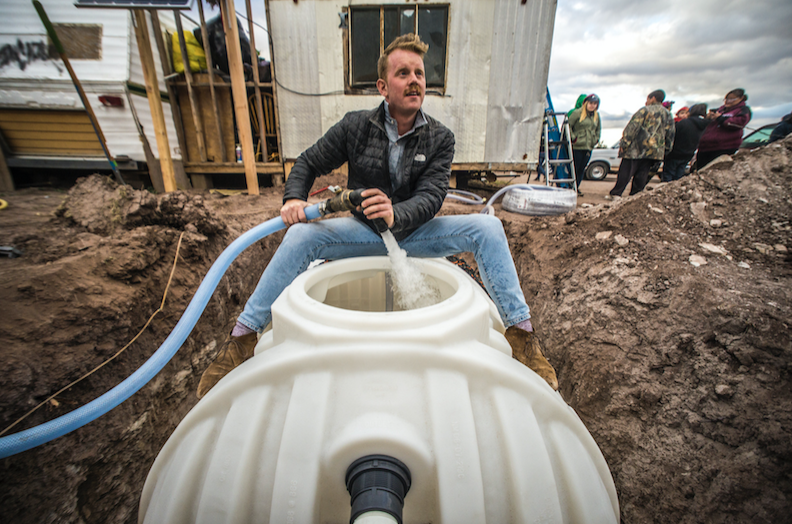 First, in areas without clean water, DIGDEEP empowers the local people with community-led water access projects, an example being its ongoing Navajo Water Project. The local community is at the forefront of all its endeavors. Second, in places like Winter Park where clean water is readily available, McGraw runs education and advocacy programs to change the way American citizens think about water. During his presentation, McGraw said, “We need a fundamental code switch.” He asserted that clean water must be viewed as a human right rather than a luxury. McGraw emphasized that DIGDEEP is more than just a water charity. It is a human rights organization because its message is that a lack of running water is an injustice. In providing clean water to the 40 percent of Navajo Native Americans who still live without it, McGraw suggested that we “map the inequality.” McGraw noted how different the modern American experience of water and the indigenous American experience of water is. McGraw also pointed out the opportunity cost of having to transport one’s own water, the potential illnesses from contaminated water, and the consequences of water poverty feeding into the greater cycle of inequality. McGraw recognized the racial elements at play in this inequality. For those with ample access to water, McGraw revealed steps to change our relationship to water so that we do not take it for granted. “I suggest finding a gallon jug-—just a regular jug—and using that as all your water for the day,” he said. He then added that, while most people can skip a shower, not many can overcome the need to do laundry. McGraw hoped that water awareness will eventually run even deeper when an appreciation for the resource is instilled in youth. With all the work that DIGDEEP does, providing clean water to the 1.6 million Americans affected by water poverty is still a gargantuan task.